I just love the holiday season. Once November hits, I find myself in a better mood all around. I love Thanksgiving, Christmas, New Year's - all of it. I don't really love the snow, but I definitely love the time with family and friends. The one difficult thing during the holidays, however, is the food. Who's going to make what...Who's turn is to to bake this or that...and how do we make it safe for everyone to enjoy? Well, with my extended family, I am normally the one who provides anything that needs to be allergy or sensitivity-friendly. My family always asks what is safe to have, and they do their best, but sometimes I just have to make an alternative or the special dish - especially if it is a more difficult one to make. Sometimes we even make allergy/sensitivity-friendly treats together. It all depends on how busy we are. It all takes weeks of planning, but it is always worth it. I decided that I would give you all some tips on how to celebrate the remainder of the holidays safely, especially if you're new to the food allergy/sensitivity world. Don't be afraid to ask questions! If you are the one providing the meal for food allergic/sensitive people, ask what is ok and what is not. They will appreciate it, I promise! And if you are the one with the allergies/sensitivities, ask what will be on the menu, and be prepared to bring an alternative. It is always better to be safe than sorry! Don't be afraid to get together WITHOUT a meal! If there are severe food allergies that make a meal together just impossible, make alternative plans. There is still plenty you can do without food. You can exchange gifts, just watch a movie or play games, make crafts - there are so many options! Be creative! Don't let food allergies or sensitivities rob you of family and friend time when they don't have to. Yes, you'll still have to make sure surfaces are clean, hands washed, etc., but it can be done - and should! Enjoy the time you CAN have - even if it isn't what you ideally wanted. Any time with family and friends is worth it! Plan in advance as much as possible! The more details you work out ahead of time, the less stress there is. Work out all the details you can, including an alternate plan in case of last minute changes due to weather or illness. It is so worth the effort to plan ahead! Trust me - there will be a lot of questions about menu choices and such, and the more time you have to work out the kinks, the better! Plan for the worst, hope for the best! By this I mean, have your Epi-pens handy, be prepared to clean up the area or leave early if needed, be prepared to bring that last minute "safe dish", but hope they won't be needed. People make mistakes - even those that love you. Something may get overlooked or forgotten. Triple check that the ingredients used were the ones agreed on. We once had a dinner at a friend's house when I suffered from my food allergies. We'd planned for weeks. She'd worked so hard to make sure everything was soy-free, peanut/tree nut-free, and fish/shellfish-free. At the last minute, she decided to use a cooking spray for the pan she made the allergy-friendly rolls on, and lo and behold, the spray had soy in it! She was mortified. I just smiled and told her it was ok - there was plenty of other things for me to eat, and everyone makes mistakes. We were able to have a great time, despite the rolls, and I know you can have similar experiences, too. Enjoy yourself! I know how hard it is to relax and enjoy yourself when there is food all over the place, especially if some of it contains your allergen(s), so I won't ask you to relax. Be diligent! You HAVE to be. However, you can still enjoy yourself. Remember that you are with those who love you and care about you and wish you no harm. Give them the chance to prove that. Don't ruin your joy with "what if"s. Be aware as you always are, but try to enjoy the time with friends and family, too. For some more great tips on how to enjoy the holidays safely, I highly recommend reading this article by Emma Hueber from ConsumerSafety.org called "What's Really in that Fruitcake? Food Allergy Safety During the Holidays". It's excellent, and there is even a great free printable to help you in your meal planning, and that you can display so that people know what's in each dish! Awesome! At the end of the article is a survey that I really hope you'll take a few moments to fill out, too. 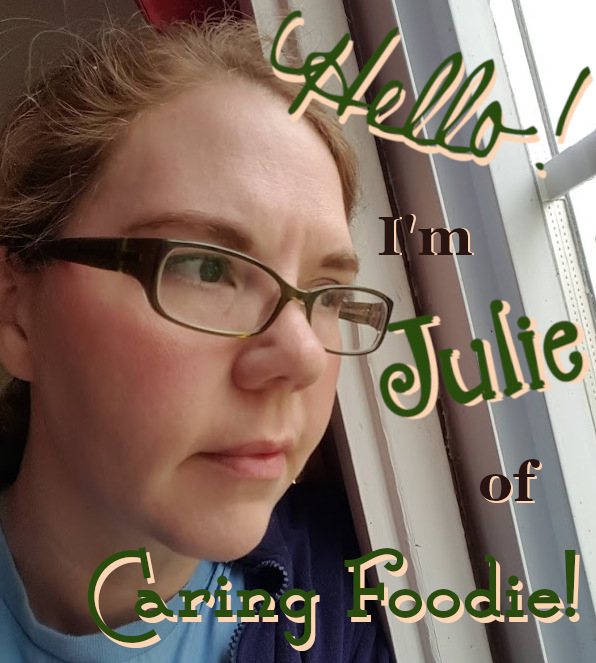 It has to do with food allergen labeling, which I believe is so important! We can never get those labels to be exactly what we need unless we make our voices heard, so let your voice be heard! What better time than now? Here's a direct link to the survey, as well: Food Allergens Survey. Thank you for taking the time to participate! May the holidays find you happy, healthy and safe! Years ago, I posted a recipe for My Wellness Tea. 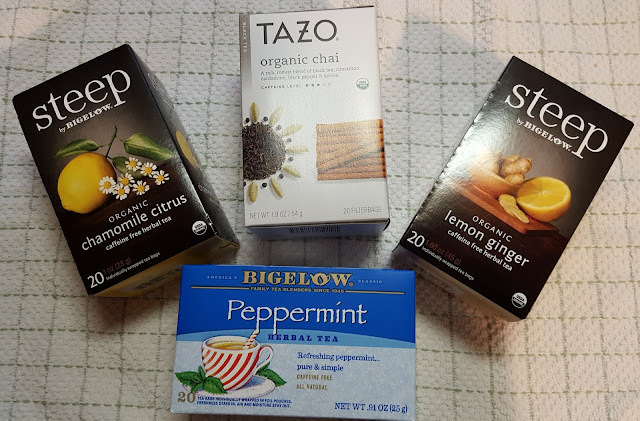 Since then, I have found a few teas that are both delicious and helpful when it comes to illness. They are also all non-GMO, kosher, most of them are organic, and they are all top 8 free! Pretty awesome, right? They would make a great addition to any pantry to keep on hand, especially during times of illness. I know I keep them on hand at all times, and they have helped us on more than a few occasions when we were dealing with various bugs. They aren't a cure-all, but they definitely do help! First up, steep by Bigelow's Organic Lemon Ginger Herbal Tea. 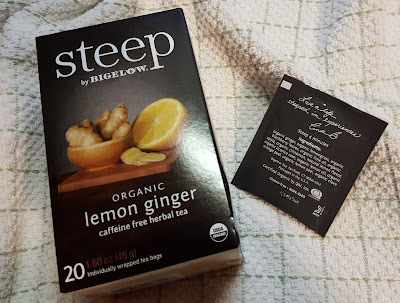 This tea contains: organic ginger, organic lemongrass, organic blackberry leaves, organic lime oil, organic apple, organic cinnamon, natural lemon flavor, organic licorice root, organic lemon oil, organic orange peel, organic lemon peel, and organic clove. It is also all natural, herbal, kosher, non-GMO, organic, caffeine-free, and top 8 free. I find this blend to be great when you're fighting some illness that involves congestion and nausea. Add a little honey to it, and it will help soothe a sore throat, too. It's got a nice, comforting heat to it from the ginger, and just enough citrus to help boost immunity. Next up, steep by Bigelow's Organic Chamomile Citrus Herbal Tea. 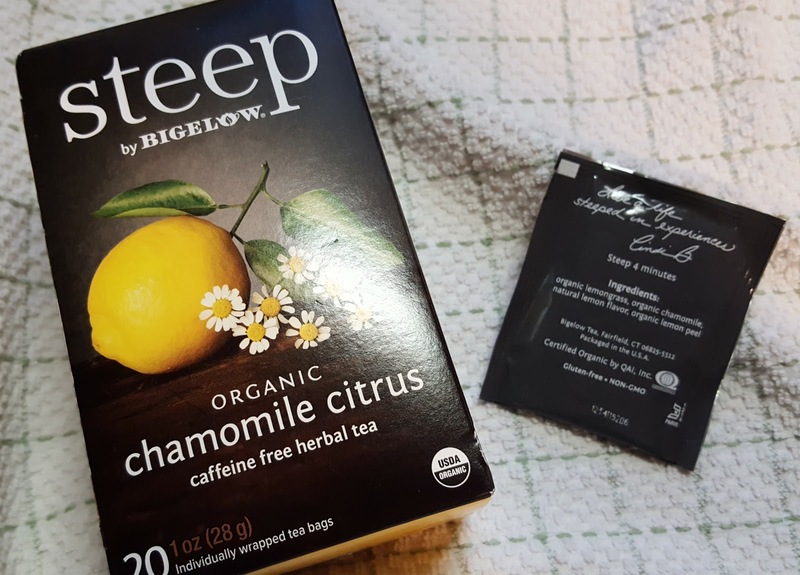 This tea contains: organic lemongrass, organic chamomile, natural lemon flavor, and organic lemon peel. It is also all natural, herbal, kosher, non-GMO, organic, caffeine-free, and top 8 free. I find this blend to be great when you're fighting some illness that involves restlessness and just feeling blah. It's very comforting and relaxing to drink, and the citrus gives your immunity a boost, which is great. If you add a little honey, it can help soothe a sore throat, too. 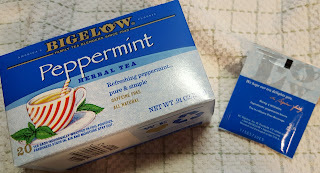 Thirdly, there's Bigelow's Peppermint Herbal Tea. This tea contains: peppermint leaves. It is also all natural, herbal, kosher, non-GMO, caffeine-free, and top 8 free. This tea is ideal for nausea. It is very refreshing, too. As with most teas, adding a little honey can help soothe a sore throat, too. Peppermint has also been known to help with headaches, so it may be worth trying for that type of situation, too. And, last by not least, there's Tazo's Organic Chai Tea. 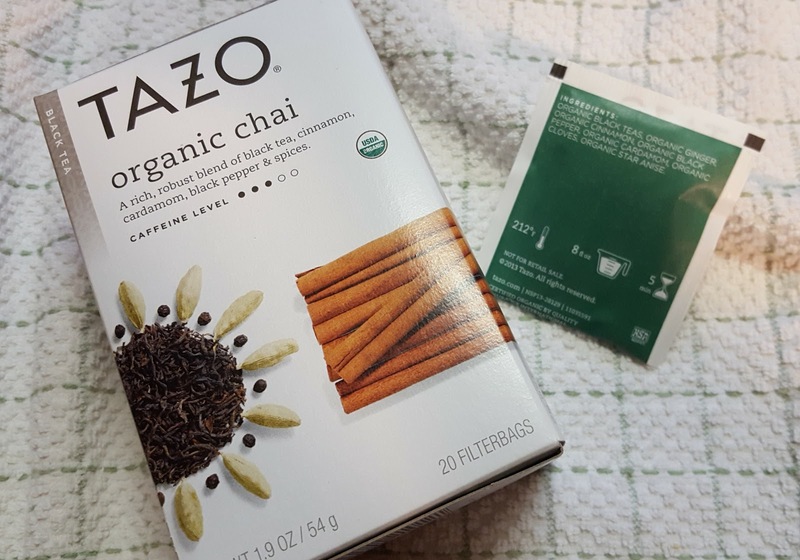 This tea contains: Organic black teas, organic ginger, organic cinnamon, organic black pepper, organic cardamom, organic cloves, and organic star anise. It is also all natural, organic, kosher, non-GMO, and top 8 free. Please note that this is NOT a caffeine-free or herbal tea. This one is absolutely my go-to wellness blend for teas. It helps with nausea and congestion, stuffy nose, and so much more. That's why I use it in My Wellness Tea. You can add honey to it to help soothe a sore throat, lemon juice to help boost immunity, or both. It is really a great product. I hope you have enjoyed this post and found it helpful! Now you have some allergy-friendly teas to add to your pantry that taste good and can help you feel better, too! Today is the twelfth and last Monthly Milestones of 2016. If you want to share a milestone post, just leave a comment below with a link to your milestone post, and I'll pop over and visit it and leave a comment, and hopefully some of my other readers will, too. 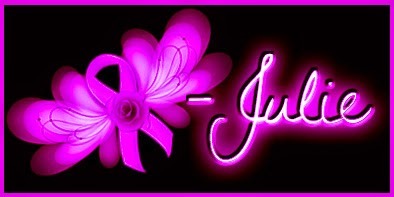 :) Normally, Monthly Milestones, where I will be giving you updates on how I am doing physically, mentally, etc., will go live on the first Saturday of every month, though sometimes I may be a day early or late depending on circumstances. Me as of today, December 3,2016, at 227 lbs. My weight is down 3 lbs. for the month, with an overall decrease of 1 lb. for the year! Though I had hoped to be down more than 1 lb. overall, I'll take what I can get. :) Hopefully the weight loss trend will continue into the new year. 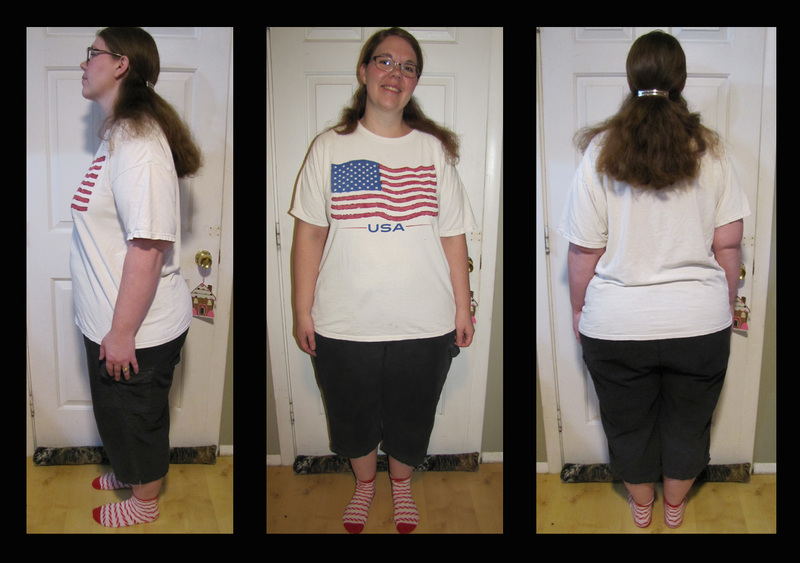 I am super excited about losing 3 pounds for the month, and being down to the lowest I've been since February. That's a great feeling. I have on been able to get back to the chiropractor once, but I am hopeful that I'll be able to go again soon, and the chiropractic stretches that are still helping. Please keep this as a matter of prayer. We got a small blessing when I went last time realizing I had overpaid (the insurance covered something we didn't think they would), so I had a balance, and we had to pay just a small sum when I went last. I am hoping to go again some time this month, but we're not sure if that will be possible due to a few things. My husband could really stand to go back, too. Anyway, prayers appreciated that the stretches will continue to help, and that we'll be able to afford to go when we need to to keep from going too far backward in our health. Thanks! Homeschooling is still going well! Monarch is still a great fit. We still plan to try to add electives after Christmas, but we're still not 100% on that due to cost and a few other things. Pray for guidance and wisdom here. Thanks so much! I have a very important unspoken at this time. As I feel I can discuss it, I will, but for now, I just ask you to pray. Thank you! Please also continue to pray for us with the homeschooling, my health, and just for us financially as we try to pay for the expenses of the last year in a timely fashion along with any new expenses as they arise. Thank you, thank you, thank you!